Save time by creating or using pre-configured integration templates available on the integrator.io marketplace. For commonly used flows, create your own library of reusable, standalone flows. 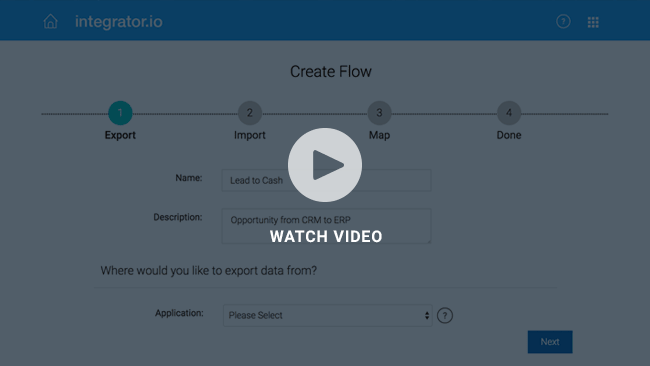 Set up multiple imports and/or exports as part of a single integration flow. Orchestration supports complex processes that require data coming from and/or going to multiple sources to complete the process. Use advanced options for more flexibility in building integrations. Create and share your own stacks, generate tokens for direct API calls, build your own wrapper, and more. Monitor and troubleshoot integration flows using the integrator.io management dashboard with the ability to re-run flows or view error details. Minimize risk and exposure of your data. SOC 2 accreditation certifies that integrator.io has controls for system security, availability, processing integrity, confidentiality, and privacy. Bulk upload data to popular cloud applications using integrator.io intuitive tools. Import hundreds, thousands, or millions of records – for free. Integration flows enable the exchange of data between cloud applications in support of a business process. Each Edition allows a certain number of integration flows to be active at any time. Data Loader performs ad hoc imports and mapping of CSV data into NetSuite, Salesforce or any other REST + JSON enabled application. Ready-to-use adaptors for popular SaaS applications including NetSuite, Salesforce and more. Support for connecting to a range of technologies and protocols, including REST, FTP and SFTP. Starter kits to help jumpstart integrations across a range of applications. Templates allow integration flow definitions to be packaged and shared with any other integrator.io user. Whereas simple integration flows connect pairs of cloud apps in a point-to-point fashion, complex integration flows allow data from multiple source apps to be transformed and routed to multiple destination apps. Subscribers to each paid Edition can expand their subscription by purchasing additional integration flows. A non-production environment for developing and testing integration flows. Sandbox integration flows are priced at 30% of production integration flows. 24×7 access to Customer Compass, an online library with reference guides, tutorials, FAQ, and videos. Live chat for quick questions and online support with 4-hour SLA for urgent items. Provides a higher level of support and includes Essential Plan benefits plus extended support hours, access to phone support, and faster SLA, including 2-hours for urgent items. Priced at 20% of product subscription for Standard and Premium editions; included in Enterprise subscriptions. Offers the highest level of support with personalized services, i.e., dedicated Customer Success Manager, proactive monitoring, and more. Priced at 30% of product subscription for paid plans. Maintenance program for custom integration flows built by Celigo on behalf of a customer. See our Customer Success page for more details. SmartConnects are prebuilt, full-featured integrations between popular cloud applications – NetSuite, Salesforce, Magento, Zendesk, and more. SmartConnectors are available for an additional monthly fee. Productivity tool which enables using Microsoft Excel to manage and manipulate data in NetSuite or Salesforce. Floral decorating e-Commerce company gain control and visibility into integrations.